Maybe it’s because I’ve been playing video games since a time when most of the signs that you’d see were little more than cartoon squiggles representing text, but I have an appreciation for detailed and creative signage. You’ll notice a few signs as you run through The Neighborhood in NBA 2K18, including the ones that direct you to The Playground and indicate that bikes aren’t allowed past that point. A sign that you may have missed, or at least not paid much attention to, is the posted list of Court Rules as you enter The Playground. The same sign can be found in a couple of places around The Playground, and as you read down the list of rules, a couple will jump out. The rules are as follows: “Use court at own risk”, “No skateboards or bicycles”, “No food or glass containers”, “Do not hang on rim”, “Proper footwear required”, “Be a good sport”, “Winners Win”, and “Be Legendary”. 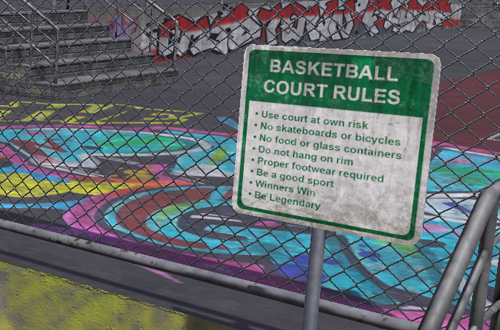 Most of the rules are ones you’d expect to see posted at your local courts, adding some authenticity to the aesthetic, but the last two are clearly for fun, invoking Scott O’Gallagher’s mantra and encouraging everyone to give their best effort and become Playground legends. I do wish that more online gamers would pay attention to that “Be a good sport” rule, though. Maybe 2K needs to add “No Cheese” and “No Ragequitting” to the list of rules in NBA 2K20. As I noted, not everyone is a fan of The Neighborhood concept, but even those who did like it in NBA 2K18 suggested that it could’ve been better designed. It was a long trek from the spawn point at the Allen Iverson statue to The Playground, which wasn’t ideal for one of the game’s most popular online modes. 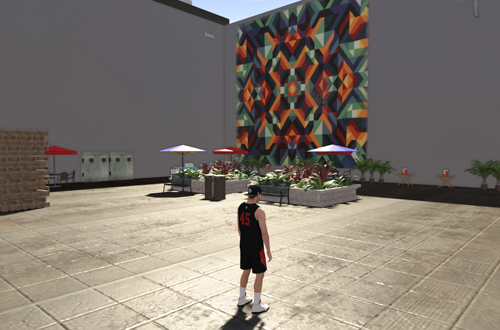 Traversing The Neighborhood became very tedious very quickly, and so it was given a centralised square design in NBA 2K19, with The Playground courts situated in the middle. While the new design does little to appease anyone who absolutely hates the approach, it’s a much less of a hassle to get where you’re going, while still being an appealing aesthetic. All the points of interest that you can interact with can be spotted the moment that you load into MyCAREER, but there’s actually quite a bit going on behind the buildings in The Neighborhood square. Duck down one of the alleys, and you’ll find that there’s a lot of attention to detail. Running through the back alleys, you’ll see trucks, a forklift and wooden palettes, dumpsters and trash bags, and artistic graffiti. You’ll even find some gardens and outdoor dining areas, as well as the Fresh Squeezed juice cart. In addition to being far more impressively detailed than they had to be, these winding back alleys have also proven to be useful for sneak attacks in dodgeball. I’ve mentioned my distaste for the writing and overall tone of the MyCAREER story in NBA 2K18 on several occasions – insert obligatory swipe at B Fresh here – but it did have some characters and cutscenes that were amusing for the right reasons. The proprietor of the Fresh Squeezed juice cart, Derick Merrick, was an odd fellow. A firm believer in wild conspiracy theories with an unusual way of looking at things, he had some genuinely funny lines that made it worth watching his cutscenes for all of those extra training drills. Come to think of it, can we trust that he was honest about what he put in that juice? With that kind of effect, there might be banned substances! Referring back to my theory that NBA 2K18’s story is either non- or semi-canonical within the MyCAREER Cinematic Universe, Derick thankfully isn’t lurking in the back alleys of NBA 2K19’s Neighborhood along with his juice cart. That does mean that we miss out on his t-shirts, though. Most of them were in-jokes about the game and MyCAREER stories, referencing Pink Diamonds in MyTEAM, the vampire film Pres and Justice go to see in a cutscene in NBA 2K17, Jackson Ellis (apparently he’s Derick’s spirit animal), and so on. 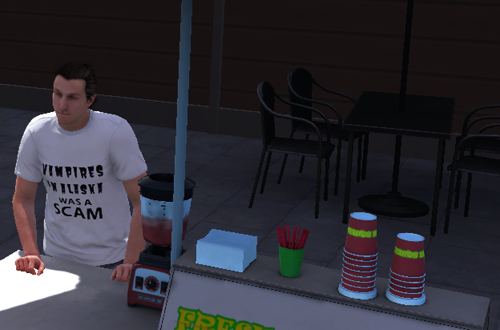 I’d suggest that someone on the MyCAREER team had a blast coming up with all those shirts, and they were a fun detail. When the Road to 99 was introduced in NBA 2K18, one of the rewards for reaching 99 Overall was to be immortalised in NBA 2K19. Any gamers who wanted their achievements on the virtual hardwood/blacktop to be celebrated had to max out their Overall Rating by the end of May 2018, and despite the long grind, several managed that feat. Their usernames can be found on the Wall of Fame, located between the entrance to The Cages and the team Pro-Am Arena. The names appear in order of when they hit 99 Overall, with GeeSice sitting atop the list on PlayStation 4. 90 Overall was as far as I could get last year, so hats off to those dedicated gamers! I mentioned the PlayStation 4 list, as the Wall of Fame does differ between the PS4, Xbox One, and PC versions of NBA 2K19, only featuring the users who managed to reach 99 Overall on the respective platform. It certainly makes sense that they’ve done that, and it’s cool that they found a way to celebrate the milestone on each platform, rather than have a global list. I haven’t seen the Wall of Fame in the X1 version, but 312 names are listed in the PS4 Neighborhood, which is quite impressive. Only four PC gamers reached 99 Overall in NBA 2K18; at least legitimately. I’m sure that many more reached it via hacking, but you’re not going to make the Wall of Fame for that! One of the most prominent landmarks in The Neighborhood in both NBA 2K18 and NBA 2K19 is the Allen Iverson statue. A monument to the first NBA 2K cover player and indeed the face of the brand for the first five games, it serves as the spawn point in NBA 2K18, and the place where dodgeball games come to fruition in NBA 2K19. 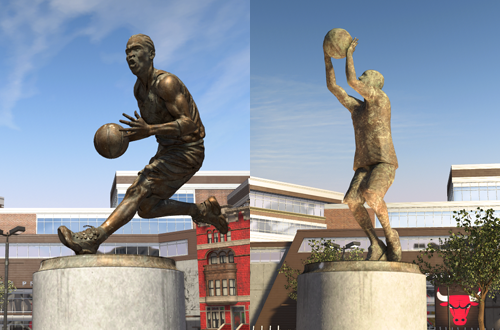 In NBA 2K19, the statue is placed in a park to the north of The Playground courts, but there are times when it isn’t present. Certain Neighborhood events require the park to transform in order to accommodate half courts, signage, and other equipment, which means the statue disappears when an event needs more room for all of its assets. There’s also at least one event in The Neighborhood that replaces the regular AI statue with an alternative monument. While participating in the Free Throw Tourney, I ran by the statue, and noticed that it had changed from a depiction of Iverson mid-dribble to a generic player attempting a shot, with the plaque on the base also removed. It’s a small and ultimately inconsequential change, but also kind of cool that they bothered to do it. It’d be fun to have the statue change for other Neighborhood events, whether it’s Allen Iverson doing different things, or the generic player in his place. If nothing else, I can appreciate what might be an easy to overlook Easter egg. Have you noticed any other cool details in The Neighborhood in either NBA 2K18 or NBA 2K19? Do you enjoy The Neighborhood concept, is it something you’ve just come to tolerate these past couple of years, or has it turned you off of MyCAREER and the connected experiences completely? Let me know in the comments section below, and as always, feel free to take the discussion to the NLSC Forum! That’s all for this week, so thanks for checking in, have a great weekend, and please join me again next Friday for another Five.